Former Beatle Paul McCartney and American heiress Nancy Shevell leave Marylebone Town Hall in central London after they were married Sunday. 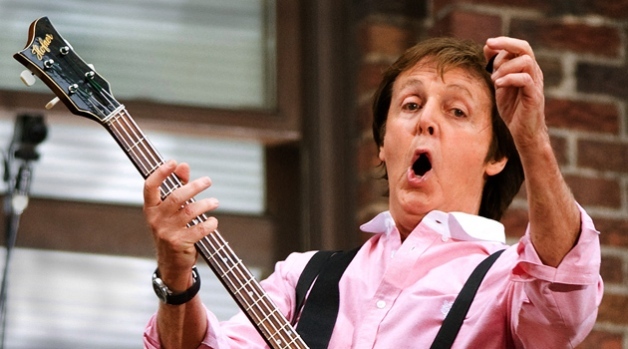 Shevell, 51, is McCartney's third wife. In a wedding that was part “Love Me Do,” part “The Long and Winding Road,” Paul McCartney married new bride Nancy Shevell Sunday in London – at the same town hall where he walked down the aisle with the first love of his life in 1969. 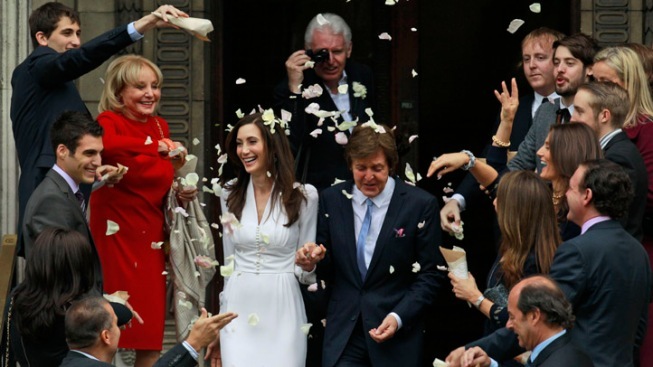 The former Beatle, 69, and Shevell, a 51-year-old American heiress, waved to hundreds of fans and photographers who had gathered at Old Marylebone Town Hall in central London as they arrived for their nuptials Sunday afternoon. She wore a long-sleeved, above-the-knee ivory dress designed by McCartney’s daughter, Stella, and a single white flower in her hair. The husband-to-be wore a dark suit with an understated purple tie. He planned to sing “Let It Be” and his betrothed's favorite “Let Me Roll It,” according to the Sunday Mirror. Sir McCartney’s 6-year-old daughter Beatrice was a flower girl, and his younger brother Mike was reportedly slated to serve as best man. McCartney’s fellow surviving Beatle, Ringo Starr, also attended – on the day that would have been the 71st birthday of John Lennon, with whom McCartney made one of the best songwriting duos in music history. After the simple civil ceremony was done Sunday, McCartney raised Shevell's hand in triumph as they walked down the steps. "I feel absolutely wonderful," he told fans as he returned back to his house in the London neighborhood of St. John’s Wood. A reception was to be held there featuring a three-course vegetarian feast concocted in part by Stella, The Associated Press reported, and the singer was expected to perform a song he wrote in his new wife's honor. It is the third marriage for McCartney and the second for Shevell, who is a board member of New York’s MTA. They have been a couple for four years, and got engaged in May. His second wife was ex-model Heather Mills. Their union produced Beatrice, but ended in a nasty divorce in 2008 that included a $48 million settlement for Mills. Back in 1969, at the height of the Fab Four’s fame, McCartney married photographer Linda Eastman at Old Marylebone Town Hall. When the Beatle known as “the cute one” got hitched then, young women and girls burst into tears outside the registry office, and it was a heartbreaking day for teenage fans around the world. They went on to have a long and happy marriage, raising four children and spending almost every night together, until she died of breast cancer in 1998. McCartney and Shevell spent the night before their wedding attending a service at the Liberal Jewish Synagogue in his neighborhood. There Shevell, who is Jewish, received a blessing before they had dinner with family and friends at a floating Chinese restaurant.